The first two quotes from John Bogle go hand in hand. Investment returns are directly correlated with the amount of risk you are willing to accept. There is a fundamental relationship between risk and return on investments that is one of the bedrock principles of investing. You should expect a small return if you only want the safety of government bonds, but you should demand a much higher rate of return from your stock market investments. The problem now is that investors feel burned and do not want to accept risk. We are raising a new generation of risk adverse investors thanks to the recent recession. If we want to beat inflation and have enough of a nest egg to retire with, we all need to shake off the recession and keep investing in riskier investments such as stocks and mutual funds. Bogle hits the nail on the head with this quote. We should all be willing to accept a short term loss in the stock market of 20%, 30%, or more. Short term volatility is often a prerequisite for long term gains closer to the historical market returns for stocks of 8% to 10% annually. The recent recession showed that a lot of investors fibbed on their risk tolerances. We all told our financial advisors that we would fine with 30% drop in the values of our portfolio and because of that, we loaded up on stocks and mutual funds. But, when the drop finally happened, we balked and got scared. We sold at the low points when our investments were the lowest. Many of us kept watching our investments and retirement nest egg sink lower and lower, and we got scared. We bailed. We were not honest with ourselves about our risk tolerance. We must be willing to accept deep short term losses in order to reap the benefits of long term gains. Like statistics, the markets follow the laws of mathematics and probability. The central limit theorem and standard distribution shows that a large number of variables is distributed normally along the bell curve. There are outliers of course that fall along the tails of the bell curve two or more standard deviations away from the mean. The center of the bell curve is the mean of course, and Bogle reminds us that we have recently seen things like stock market returns and home values that have been far away from their means or their historic averages on the bell curve. Bogle, like a lot of others, says that we will see a return to the historic averages in financial markets. The same can be said about real estate values, investing, and lending as well. My boss recently talked to myself and my peers about this fact. We all should never stop learning, and we can benefit from seeing and hearing about other people’s mistakes. I think that that is the fundamental benefit of personal finance blogs like Own The Dollar. You can learn from my personal finance and investing mistakes and other people’s mistakes as well in order to save your own money from a similar plight. John Bogle is the founder and former CEO of The Vanguard Group. He is considered one of the pioneers of the mutual fund industry. He founded the Vanguard 500 Index Fund in 1975 which is widely considered the first index mutual fund. 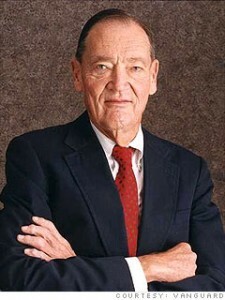 Bogle is famous for his insistence in his numerous books on the superiority of index funds over traditional actively-managed mutual funds. He believes that actively managed mutual funds cannot beat a well run index fund over a long period of time. Previous post: Home Ownership Is Flat Throughout The Recession – So, Who Is Getting Foreclosed On Then?